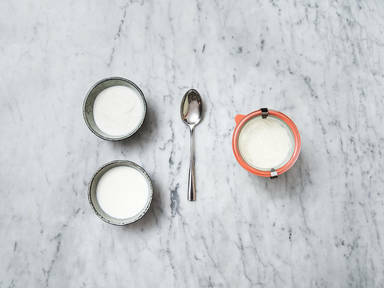 In a saucepan over medium heat, cook milk until it reaches 90°C/200°F‎. Whisk often. For a thinner yogurt, let the milk cook for approx. 10 min. For a thicker yogurt, approx. 20 min. Take the pot off the heat, and bring the temperature of the milk down to 50°C/115°F. This can be done quickly by sticking the saucepan into an ice bath. Remove one cup of the cooled milk and add to a bowl. Mix in yogurt, then return the mixture to the original saucepan and whisk to combine. Ensure that the temperature remains around 50°C/115°F. Transfer the mixture to an oven safe, airtight container (like a mason or weck jar) and let set in a pre-heated oven at 50°C/115°F for approx. 4 hrs. or up to 8 hrs. Remove the lid and check the consistency of your yogurt after the desired time. If there is any liquid on the surface of the yogurt, you can stir it in or simply drain it off. The yogurt can keep for up to 2 weeks in the refrigerator. Serve with fruit, honey, or granola and enjoy!